When the temperature heats up, all you can think about is cooling off at the local pool or lake. 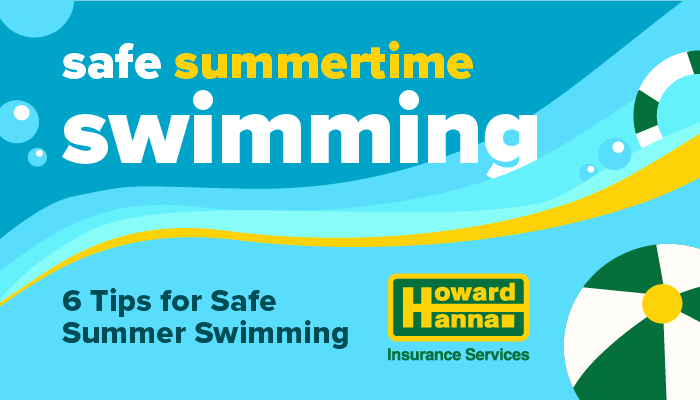 Howard Hanna Insurance Services has some safety tips to keep in mind any time you jump in. Don’t go alone. Swim only in designated areas, with a lifeguard if possible, and use the buddy system – even adults shouldn’t swim when no one else is around. As for children, they should never be left unattended in or near the water or supervised by another child. Mind the rules. If an area forbids diving or is closed for swimming, that means it’s unsafe to do so. Be sure to follow all posted rules and warnings. Keep away from drains. In a pool or spa, a drain’s powerful suction can trap swimmers. Be sure everyone knows to keep their distance. The same goes for riptides and currents in an open body of water. Know how to respond. Learn CPR and other skills that can save lives. Use common sense. Do have life jackets for inexperienced and experienced swimmers alike, and keep plenty of sunscreen and water on hand to help everyone beat the heat. With a little caution and a whole lot of supervision, you can help ensure your day at the pool or lake goes swimmingly!